Remember our Superhero Cape Challenge? We Have A WINNER! Emma, granddaughter of Tammy Johnston of Source One Supply, accepted the challenge (back in April) to give away a blanket within 60 days to someone in need. She gave hers to an expecting mother at the Stagger Straight Community Emergency Shelter. I told her I want her to know she’s special and I want her to know her baby is special. It’s clear that Emma has a huge heart and she intends to keep giving back to her community. 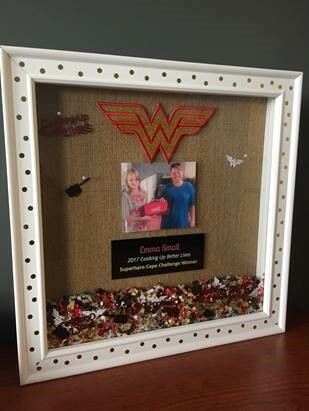 As the winner of the Superhero Cape Challenge, Emma received a customized plaque commemorating the act of kindness as well as a donation of 100 blankets on her behalf to the recipient of the 2017 Better Lives Makeover, Creative Dreams in Texas.